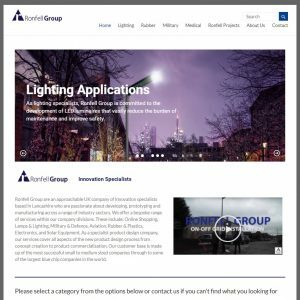 Ronfell Group Ltd is evolving rapidly; since the business was established over 30 years ago we have been working with many clients in the lighting, rubber, military, and marine industries. During the autumn of 2017 we decided to evaluate our structure to help us understand our core values that represent who we are, so we could create the perfect platform for our customers. The launch of our new website signifies a new era within Ronfell Group. With family at the heart of the business we believe it important to seek new relationships whilst looking after our pre-existing ones. In order to achieve this we planned and developed our brand new site over a six-month period with the single aim of making our customers user experience more simple. Today we are pleased to share www.ronfell.com with the industry. Key features of the newly designed website showcase a clean design where visitors can access full catalogues of our products ranges with a few simple clicks. The site has been produced by two members of our team who worked tirelessly with the aim of improving our customer service. 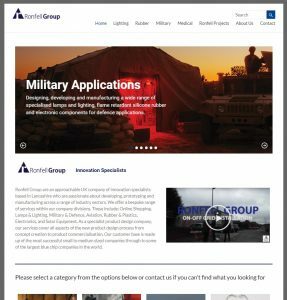 With that in mind, we wanted to create a simplistic landing site which was easily navigated, indicating the right pathways to the plethora of products we offer; in fact, our homepage perhaps features some of our most significant work. Equally, our product catalogues are a fundamental part of the new website. Broken down into distribution and industry sections we have created a one-stop ebrochure for everything we can supply.